VanGogh Gaming's TinyMiner & TinyTrader Free Trial Page! Other fly-by-night Eve Mining Bots ask their users to disable the UAC (User Account Control) in order to even work! The UAC is a very important part of Windows and it helps to protect your PC so it should Never be turned off! Harry Potter (who plays Eve Online!) says this Eve Mining Bot is just magical! Start up (in station, in a mission, in an asteroid belt, at a POS or anywhere else). Undock (if started in station). Optionally use the "Gate Mining" feature (jump to a nearby system full of asteroid belts but no station in it). Warp to a random asteroid bookmark from your Mining Folder. Optionally use the "Warp from bookmarks at 200km away" feature so that you can always land exactly on the first asteroid from the Overview thus maximizing your mining yield by avoiding any unnecessary slow-boating towards asteroids that are out of range. Optionally launch mining or combat drones and start active modules of your choice (shield boosters, armor repairers, active hardeners, etc). Mine the asteroids and Fill up the ship's cargo (optionally monitor the local chat for hostiles or the directional scanner in Wormholes). Optionally monitor the private messages or local chat log files for the keywords you specify and act accordingly. Dock back to station or Jettison the cargo into space for your fleet members to pickup. Unload cargo in station or at a POS Corporate Hangar Array or Jettison it at a safe spot for your Orca booster pilot to pickup. Optionally reload new mining crystals and repair the damage taken by your drones. The trials do a single mining Run like this while the registered versions can do as many Runs as you want. You're free to evaluate them for as long as you want. Make sure to read the fully illustrated setup tutorial and you'll be up and running in 5 minutes. Yes it's that easy! You'll be amazed at how efficiently TinyMiner will mine with your ship or rapidly transport or pickup your goods over many stargate jumps! TinyMinerPlus does All that with two EVE clients on the Same computer at the Same time for a total Mining Extravaganza! "Check Belts for Rats" at arrival as well as during mining cycles and "Kill Belt Rats with Combat Drones" for the ultimate safety. No other mining bot has this feature! "Check the Probe Scanner for Ore Sites" (including ICE belts!) to find a better alternative mining place than regular asteroid belts. No other mining bot has this feature! "Switch ships for mining ORE or ICE depending on the availability of ICE belts. No other mining bot has this feature! "Auto restart Eve Online after the daily downtime" to make sure you never miss a mining moment. "Orca/Rorqual drones-mining mode" for truly mining like a boss without worrying about starting and stopping lasers! No other mining bot has this feature! "Mining Drones" for an even greater yield. Every little bit helps if you are serious about mining! "Monitor local chat for Hostiles" and "Monitor the OnBoard Scanner in Wormholes" for the ultimate peace of mind! The directional scanner will stop those dirty pirates dead in their tracks! No other mining bot has this feature! "Jettison Can" option for those boring fleet operations. Stop wasting time going back and forth to unload in station! "Jettison at a Safe Spot" option to avoid those pesky can flippers. The perfect parking spot for your Orca booster pilot! No other mining bot has this feature! "Warp directly to the asteroids from bookmarks at 200km away in each belt" option for supreme efficiency. Eliminate any approach time with this feature! "Gate Mining" option for those juicy systems full of asteroid belts but no station. You can now mine them and unload the cargo in a nearby system and at the same time stay safe from suicide gankers. "Voice-over" option - TinyMiner can talk to you in plain English! No other mining bot has this feature! "Local Chat Logs and Private Messages Monitor" helps to protect against human detection by searching for specified keywords and even responding with random saved messages to convince anyone that you are a real person mining peacefully! No other mining bot has this feature! "Repair the ship in station" - This will also repair your drones that may have been damaged by rats! No other mining bot has this feature! "Load mining crystals after unloading the cargo" - This feature will always make sure you have fresh mining crystals in your cargo ready to be loaded when the equipped ones run out! No other mining bot has this feature! 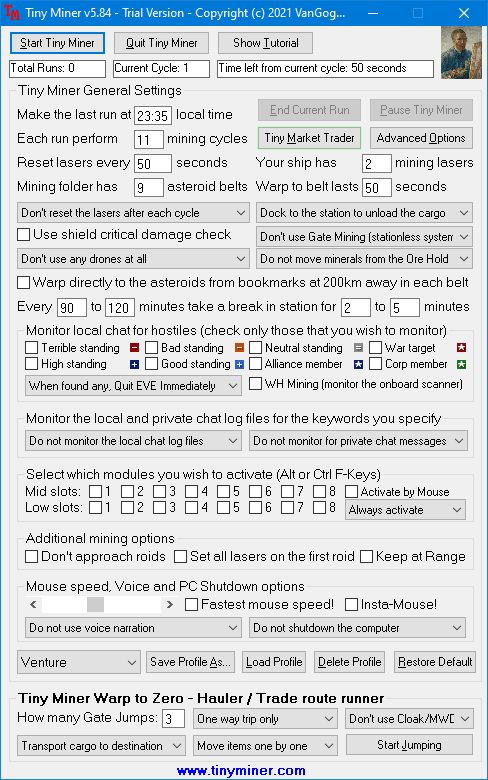 "Mission Mining" - With this option TinyMiner can operate the acceleration gates so you can mine all those juicy asteroids from agent missions and at the same time keep a low profile from grievers and haters! No other mining bot has this feature! "Full Cargo Check" - When you select this option TinyMiner can can check whether your cargo or ore hold is 80% or 100% full (your choice) and extend the current mining run with one more cycle until it fills up that much! No other mining bot has this feature! "Email Notification" - With this feature you'll always stay on top of things since you'll receive an email on your smartphone whenever something unexpected happened to your mining session! No other mining bot has this feature! "Microsoft Authenticode® Certified" - TinyMiner is digitally signed to ensure its authenticity and the peace of mind knowing that you are running a safe application! No other mining bot has this feature! I had doubts but 5 years later this is still rocking! I Cried, I Moaned... DON'T DO IT! Superb application, extremely satisfied user. Do not hesitate! Get TM and Enjoy! Made my money back and more!! Just a general thank you. I was a little dubious. TinyMiner v5.47 - Excellent First Impression! So good I just had to buy it! I've tried another bot and TinyMiner is much better! Great App - How much are you guys making per day? *All testimonials are real and have been written by actual TinyMiner clients. Click here to verify them on the forum!